Great poncho, and an awesome way to bring more awareness! Oh wow. That's awesome and for such a good cause. I can't think of a more misunderstood condition and this is such a fun representation of it. Good show! Purveyor of idiosyncratic gastropornography since 1976. This is AMAZING! Super nice work! I've always wanted to make an afghan or something that looked like a puzzle I would wear this poncho everywhere! This Rocks! I took a photo of my graph for those who wanted to make something using the pattern. 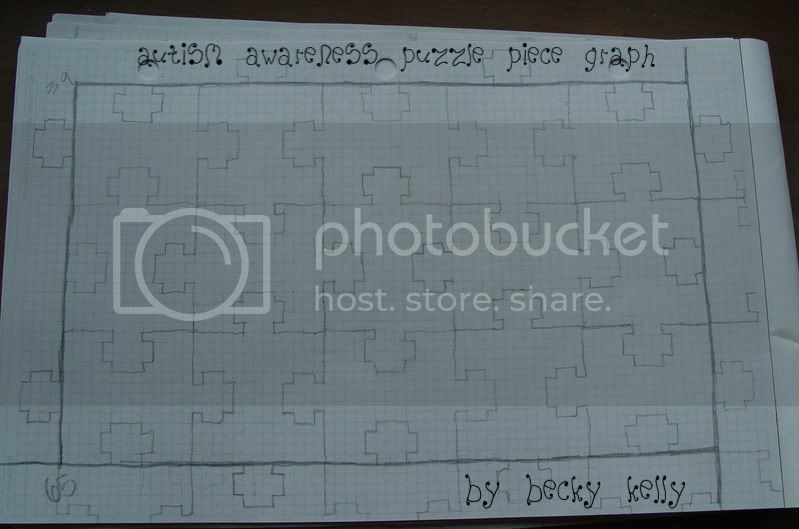 Each puzzle piece is 13 squares across, (minus the "heads". If you keep that number in mind you won't mess up. The outlined area is what I used for the poncho. (But the third row is really a repeat of the first row). All you really need to remember is two squares across and two squares up. (But it does help to draw out more of it to visualize it in your mind better). I'd love to see the things you all make with it! this would be an awesome present for my mom.